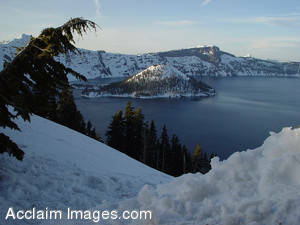 Description: Stock Photo of Crater Lake National Park. Crater Lake National Park is located in Southern Oregon. It is the second deepest lake in north America and the deepest lake here in the United States. This photo is available as an art print or poster and may be licensed as stock photography.